You might be hearing about us through the grapevine… we’re excited and we want you all to know about it! We have been featured in various articles in the Townsville Bulletin, and we’re also on the radio, thanks to Southern Cross Austereo! Exciting things are happening here at Hampton Grove. 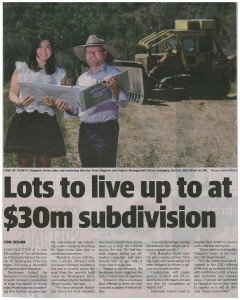 Land lots have been pegged out and construction has begun for Stage One, due to a successful off-market sales campaign. And yes, you read correctly! We are bringing forward Stage Two Hampton Grove, due to strong sales of Stage One. If you were considering registering your interest for a dream homesite at exclusive Hampton Grove, do not wait any longer! There are still lots available in Stage One, however you must act fast. Hampton Grove is more than another residential development in Townsville. It is a movement in the quality and lifestyle standards of the area, and an opportunity for locals to build their dream home. As the closest land development to the Townsville CBD, with land sites over 1000 square metres, it’s an opportunity that shouldn’t be missed. 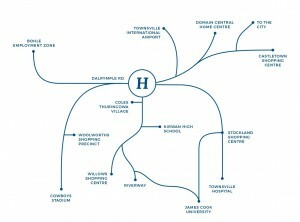 Hear about all the progress with Hampton Grove here first – register your details! It’s the little things that make a big difference when building in Hampton Grove. We have considered all of the little things, in order for you to achieve your dream home at this exclusive site. As local developers with a broad range of experiences, we wanted to provide a set of guidelines for building your home, to provide confidence for you, the buyer, and for your builder. The value of your home relies on the homes around it, and these guidelines are in place to ensure the quality of this exclusive development, and the lifestyle it offers. Ensuring garages do not dominate the front façade, houses with a width that matches the land width, the style and consistency of a fence… these are just some examples of the little things we have considered in our vision for Hampton Grove. Don’t worry, these little things don’t have to come at a great cost, however they do make a big difference to how your home presents to the street. It’s about setting a standard so you feel at home in a neighbourhood with like-minded individuals, who appreciate the premium, private community that is Hampton Grove. These are guidelines, and we are happy to discuss what you are hoping to achieve when building your home. Wow! What a fantastic turn out at our onsite land release event over the weekend. Stage One Hampton Grove became available at 9am on Saturday 23rd April, with eight lots now on hold for some excited couples and families. We received an incredible amount of interest online and still have some land lots available, however you need to move fast! Hampton Grove is for locals, produced by locals. We are local developers, who understand the lifestyle priorities of Townsville residents. Hampton Grove is for owner-occupiers, who want enough space for the perfect home, gargage, verandah, barbeque, pool and entertaining area; a dream homesite for life. Building your perfect home on such an exclusive, large allotment can be daunting, but as local developers we are also confident with the local construction industry. We are in contact with a range of quality builders who understand the unique opportunity available at Hampton Grove, and are ready to assist you. Hampton Grove is not just a residential project for us, but a project for the community. Register your interest today to keep up to date with ongoing progress with this incredible project, and secure your opportunity to call Hampton Grove ‘home’! We’re excited to introduce you to Hampton Grove, an exclusive residential development of 47 premium and private land lots, based on the foothills of Mount Louisa. Here in Townsville, we love wide, open spaces, breezes, an outdoorsy lifestyle, and privacy and security for our families and friends. Our beautiful city is growing, with a rising population and booming business and tourism industries. At a glance, residential communities are being encouraged to spread out amongst the outer regions of the city, up the Northern coastline and out around the foothills of Mt Stuart. We all want space to grow; our community, our personal families and livelihoods. Hampton Grove is a unique opportunity. With land lots starting at 1000 square metres, there has never been so much space to grow, so close to Townsville’s key amenities. Located on the corner of Dalrymple Road and Thuringowa Drive, Hampton Grove is connected to an extensive network of shops, entertainment precincts and employment hubs. You don’t need to compromise on centrality for space at Hampton Grove. We’re kicking things off with a first land release event, on site at 9am Saturday the 23rd April, 2016! Stage One land release will be available to people who have registered their interest – so submit your contact details today. We will be offering $10,000 off the price on all lots we receive an Expression of Interest form completed with lot number, price and a holding deposit of $1,000 paid by 7th May, 2016. This is a once in a lifetime opportunity to secure your dream homesite in this private and exclusive location at this pricing!